MR. MONK ON THE ROAD is #10 on Baker & Taylor's mystery bestseller list today. This is especially thrilling for me since ROAD isn't officially out until next week. Baker & Taylor is a major book distributor and their bestseller list is derived from their sales to all their clients… bookstores, libraries, educational institutions, etc…. over the last thirty days and is updated daily. The Los Angeles Times reports that Barnes & Noble is now selling more ebooks than paper ones at their online store. Customers bought or downloaded nearly 1 million e-books on Christmas Day alone, the company said in a press release. The Nook e-reader has become a bestseller, according to the bookseller. The Nook Color, introduced two months before Christmas, was the company's No. 1 selling holiday gift item, according to the company release. Maybe so, but sales of my books on the Nook have been lousy…about 75 copies in December. On the other hand, this has been my best month ever on the Kindle. I've sold 800 copies of THE WALK as of today (nearly 20,000 total since I launched the ebook in June 2009) and I'm looking to earn $5000 in royalties this month from all of my out-of-print work. Goldberg, 48, wrote numerous scripts for the “Monk” television show starring Tony Shalhoub. His novel for the complementary Penguin Group book series will be released Jan. 4. “Books based on television shows do well because people enjoy reading about familiar characters,” Goldberg said. 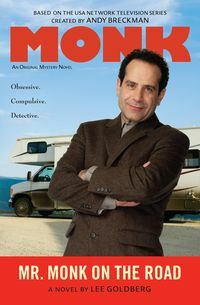 Although Adrian Monk’s phobias and tics leave him incapable of handling the simplest aspects of day-to-day life, the detective is able to solve baffling murders. Goldberg also has produced shows and written dozens of novels and nonfiction books. Goldberg said he works in an array of genres, including science fiction, crime, the occult, comedy and mystery to stay competitive in his trade. “As a professional writer, I can’t wait for inspiration to strike. I go where the work is. I’m an artist, but at the same time I’m practical,” he said. You've written several wonderful articles on the ways that technology has influenced reading and writing. May I interest you in news around HubPages, an online publishing community, that's generously rewarding writers – with money, readership and recognition?HubPages gives writers a free, search-enabled, online ad-equipped writing platform. HubPages then uses its in-house technology to run the best possible ads within the content, and – shares 60% of the ad revenue with the writer. In its 4th year, HubPages is now in the enviable position of helping writers of various levels make a living through the site. As the publishing industry tries to find a better business model, rewards for writers are getting more and more difficult. Here's a company that is going against the general trend, and is thriving while helping writers earn a living. Apparently, she hasn't read my blog very closely, because I am the last person you want to pitch with another get-rich-quick scheme for writers. The way Hub pages works, you blog on their site, they load your post full of ads, and when you get hits, you get rich. They also offer to help you hone your writing skills by using feedback from other "hubbers" and taking advantage of their archive of articles on writing. So I took a look at one of their highlighted articles, this one on fighting writer's block. Participate in the weekly HubMob: Every week, the HubMob team shares a new topic and challenges Hubbers to write Hubs on it! These topics are search-friendly and perfect for getting your writing back on track when you are running out of inspiration. As I mentioned in my last hub if I get a hubbers block, I go out , visit the library, read, go shopping to fill the gap. You can't get hub wisdom like that anywhere else. So I checked out what other advice this long-time hubber had on how to make Hub pages earn Hub money for Hub me. Before HubPages, I was a blogger, I started blogging in 2005. I have learned the ins and outs of blogging but never really earn any cents. I knew I am doing something wrong but I don’t know what. To be honest, my main purpose in writing online is to supplement my income. I have read a lot about full-time bloggers claiming that they support themselves through online writing, apart from blogging they also offer how to become successful through blogging by following what they have written in their e-books, I am sure you have hear about this story too. […] I discovered Hubpages in 2007 while looking for job ads at Problogger. I did not hesitate, I sign in at HubPages, which is a user content generated site. Writers are called hubbers and write individual webpages called hubs on any topic. Hubbers earns through Google Adsense which appears on individual hubs and the revenue is split by 60:40. This is achieved by alternating the code used in advertisements: the Hubber's code is displayed 60% of the time, and HubPages' code 40%. I think it is a fair deal —well this is good for me. I try to learn everything by reading the Forum, I bookmarked hubs, I keep reading and take notes on tips suggested by Hubbers. I ask questions and learn and get educated. One of the best advise I have read at HubPages was written by Paul Edmondson (Co-Founder and CEO of HubPages) to write articles about topics that don’t change – and he called it evergreen content. Paul compares writing evergreen content to like owning a bond that pays dividend. The hubber writes the article, then it pays a dividend over a long period of time with traffic to your site. With this in mind, I write my hubs following his advise religiously. How to get accolades for writing in HubPages came from a reader's question. I was asked the following question, how to get accolades for HubPages? The question is from Hubber pandyprashant. Firstly thank you for the question, that is an accolade in itself. The first two points I would like to make I think are fairly obvious. Firstly you shouldn't write on HubPages with the goal of getting accolades and secondly if your content is worthy it will receive accolades organically. I have written a hub about praise and that best explains I think how to give and receive praise. With Hub writing skills like that, I'm sure he'll be heaped with accolades…not to mention Hub money from all those Hub ads (though how much he's earned is one Hub nugget of Hub information he doesn't Hub provide). For that, I checked out a hub on "How to Get Started Earning Money on Hub Pages." I knew this article had to be good, because it got a score of 100 from Hub Pages. Earning money on HubPages is not going to come easily, you are going to have to work for it. You are going to have to put some time into is as well, possibly several hours per day in the beginning. Anything worthwhile takes time and effort, you will find that perseverance pays off. You wouldn’t expect to go to a job and do nothing while being paid a wage would you? Look at HubPages as being a new job. What do you do at a new job? Are you a full timer? Did you want to start your job as a full time employee? Remember in the working world most full time jobs are 40 hours per week. The benefit of writing at HubPages is you get to pick and choose the hours you work, and break them up as you find necessary. So you can spread that 40 hours over a period of 7 days if you wish. Spending about 5 ½ hours per day on writing. […]The benefits of writing on HubPages for a new person is just this. You learned how to write in school and are able to string some words together that make perfect sense. You have good ideas and want to put them to use. At first with any job you will find that your work isn’t perfect. Most companies allow you a ‘do over’, they don’t expect anyone new to get it perfect the first time. HubPages is the same, they allow you to go in and edit your work to make it better. To get your feet wet with writing, you are allowed to write about anything you wish. That’s kind of like getting a factory job and being allowed to run any machine you want to, how great is that? Hub allows you to write anything you wish. That really is amazing. Sort of like what I am doing right now without the Borg, er, the Hub. I like her factory analogy, too, but more on that in a moment. She goes into great length on her hub about how to maximize your posts for Goodle Adsense and search engines…things you can do on your own blog without having to share any of that revenue with your blog host or with Hub, those folks who so graciously let you write whatever you want. The money will come in time, it’s not something you will find overnight. Just keep writing, continue to improve your writing skills and read the Hubs of others. There are Hubbers writing Hubs about writing. Go meet them, read what they have to say. Ah yes, all that valuable Hub feedback. That really is worth more than money, isn't it? That Hub love is the real reward. Basically, Hub Pages is a writing mill…where they get you to write content for free that they use game search engines and generate ad revenue for themselves. You get a percentage of that revenue, which might earn a few pennies for you (if you're very, very lucky), but with 200,000 users, that adds up to real dollars for Hub. You make the pennies, they make the dollars. You are free labor…rats running on a wheel kept happy and engaged by meaningless accolades of other "hubbers" and sense of membership in a community. It's a shrewd way to run a sweatshop and fool the workers into thinking they're not being exploited. But it's still just a food pellet. You can write the same essays, post them on your own blog and load it with ads…and earn 100% of the ad revenue instead of just a percentage. The downside? Hub doesn't earn money off of your back, you won't be able to communicate in Hub talk or get those meaningful Hub accolades. But you can always create your own language. Mine is Lee talk. You just stick my name in front of everything. That is the end of this Lee (a blog) and I hope all of you Lee-ees (readers) have found it Lee interesting (that's really interesting, in the Lee-sense of the word). UPDATE: An angry hubber who asked me not to quote her hubmail sent me this hub link to some Hub pages Hub success stories. Of course, they don't reveal what percentage of all Hub users are earning as well as those folks… or how much more money these atypical hubbers might have earned off of those same posts by cutting Hub pages out of the equation, putting them on their own blogs and using Google Adsense, Amazon, etc. It's also interesting how these few successful Hubbers refer to their ad revenues as "passive" income I guess no work went into writing the 500-600 blog posts they had to write to earn that money. It's that sweat equity that Hub pages is making all of their money from. They are the only ones who are consistently making money, even off the posts that don't earn much for the individual writers. The guys running Hub have 200,000 people writing free content for them to game search engine with and make money off advertising. Getting other people to do the work for you while you earn money off their labors, now that is real passive income and a genuine money-making opportunity. Joe Konrath can't wait for his books to go out of print. When that happens, the 40-year-old crime novelist plans to reclaim the copyrights from his publisher, Hyperion Books, and self-publish them on Amazon.com, Apple Inc.'s iBooks and other online outlets. That way he'll be able to collect 70% of the sale price, compared with the 6% to 18% he receives from Hyperion. As for future novels, Konrath plans to self-publish all of them in digital form without having to leave his house inSchaumburg, Ill.
"I doubt I'll ever have another traditional print deal," said the author of "Whiskey Sour," "Bloody Mary" and other titles. "I can earn more money on my own." For more than a century, writers have made the fabled pilgrimage to New York, offering their stories to publishing houses and dreaming of bound editions on bookstore shelves. Publishers had the power of the purse and the press. They doled out advances to writers they deemed worthy and paid the cost of printing, binding and delivering books to bookstores. In the world of print, few authors could afford to self-publish. The Internet has changed all that, allowing writers to sell their works directly to readers, bypassing agents and publishers who once were the gatekeepers. It's difficult to gauge just how many authors are dumping their publishing houses to self-publish online, though for now, the overall share remains small. But hardly a month goes by without a well-known writer taking the leap or declaring an intention to do so. It is certainly the hot-topic of discussion whenever I get together with my writer-friends. I even had a long talk about it with my publisher during Bouchercon, who seemed honestly stunned by the money I was making off my backlist, particularly THE WALK. In fact, my wife was looking at my Kindle royalties the other day… which have hit an all-time high and are paid within weeks… and asked me why I even bothered continuing to write my MONK novels. Even the CreateSpace print-on-demand paperback edition of THE WALK is selling surprisingly well (If sales continue at the current pace, I'll sell 150 copies of the paperback this month, with a royalty of $4.04 per book). All of that is gravy…remember, these are out-of-print books of mine that we are talking about. Even though the MONK books sell very well, in hardcover and paperback, my royalty rate is substantially less than what I earn on my out-of-print work on the Kindle. And it can take more than a year, often much longer, before I see any royalty checks, particularly on my early, three-book deals that were cross-collateralized (on those, I don't get paid until all three books earn out my advance). And then, of course, there's the commission my agent takes from every check (and I am not begrudging her that at all, she worked very hard for it). So yeah, self-publishing is looking very good to me. Something that would have been inconceivable to me as recently as two years ago. Authors typically get 10% to 25% of the proceeds of digital sales if they go through a publisher, compared with 40% to 70% if they self-publish. For Konrath, the math made his choice easy. He said he earned $1.17 in royalties for each digital copy of "Whiskey Sour" sold by Hyperion. That's roughly 25% of the sale price of $4.69. When he self-publishes on Amazon, Konrath prices his books at $2.99 and earns $2.04 a copy, or just under 70%. "If a traditional publisher offered me a quarter of a million dollars for a novel, I'd consider it," he said. "But anything less than that, I'm sure I can do better on my own." He makes a good point…one readers of this blog have heard repeatedly. The publishing world has changed dramatically in the last twelve months and so has my thinking about my own future as an author. I will keep writing the MONK books as long as they continue being successful…but I honestly don't know whether I will take my next original novel to publishers, unless my agent can convince me it's a game-changer that will be a break me out of the mid-list. For an established mid-list author like myself, I can't say that working with publishers really makes much financial sense any more…it certainly doesn't to my wife, whose opinion carries a lot of sway with me. With millions of titles potentially flooding the market, readers will have to rely more on external cues to guide their purchases, whether it's a favorable review from a celebrity, a tip from a social-media contact or the backing of a major publisher. "Until someone comes up with an algorithm to sort the good manuscripts from the bad, publishers and their human network of agents and editors maintain an advantage," McQuivey said. "But sooner or later someone will create a new way for readers to find the books they most want to read, and that someone may or may not be a traditional book publisher." It may not even be human. Amazon, Apple Inc., Netflix Inc., Pandora Media Inc. and other technology companies use software that analyzes consumer behavior to recommend choices in music, movies and other products. Indeed, the challenge in a world where anyone can publish a book is getting people to pay attention. To that end, in my our own small way, I've banded together with Max Allan Collins, Vicki Hendricks, Harry Shannon, Joel Goldman, Dave Zeltserman, Ed Gorman, Paul Levine, and Bill Crider to create Top Suspense, a place where readers can find ebooks by estalished, acclaimed, award-winning writers whose work they can rely on to deliver the goods in a variety of genres…horror, westerns, mystery, thrillers, and crime. It's a small step…but it could blossom into something more. At this point, everything in the digital book world is an experiment of sorts…but exciting and full of possibilities nonetheless. "Remaindered," written and directed by veteran television writer Lee Goldberg, has been selected to be screened at the Derby City Film Festival, which is Feb. 18 to 20 in Louisville, and the Beaufort International Film Festival, which is Feb. 16-20 in Beaufort, S.C. The film premiered in mid-October at Bouchercon, an internationally known mystery convention that attracts mystery writers, fans and others in the mystery world. "It's gotten greater feedback than I ever anticipated," Goldberg said. "Greater positive feedback." 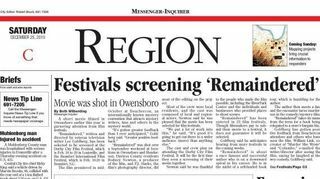 "Remaindered" was shot over a September weekend at locations in Owensboro and Henderson. Daviess County residents Rodney Newton, a producer of the film, and P.J. Starks, the film's photography director, did most of the editing on the project. Most of the crew were local residents, and the cast was composed of local and regional actors. Newton said he was pleased that the movie has been selected for film festivals. "We put a lot of work into this," he said. "It's good it's going to get out there to a wider audience (more) than anything else." The cast and crew plan on attending the Derby City Film Festival. It will be the first time they seen a screening of their movie together. Newton said he was thankful to the people who made the film possible, including the RiverPark Center and the individuals and businesses who provided places to shoot scenes. […]Goldberg filmed "Remaindered" in Owensboro after participating in the 2008 and 2009 International Mystery Writers Festivals at the RiverPark Center. Goldberg called "Remaindered" a great calling card for the mystery festival. The festival was canceled in 2010 because state funding came through too late for RiverPark officials to raise matching funds. The RiverPark Center hasn't decided if it will host the festival in 2011. Goldberg said another city will decide to host the festival if Owensboro doesn't. "This film is like a Goodwill ambassador for Owensboro and the mystery writers festival all around the country," he said. "I just hope that the folks in Owensboro continue to support the festival." Goldberg said he's been flattered by the film's reception, not just for himself, but for the cast and crew as well. "I was just lucky to be the captain of the ship," he said. Many thanks to reporter Beth Wilberding for the great article. My friend Paul Levine reveals in an interview at Top Suspense that he became a novelist by writing what he knew…and wasn't so wild about anymore. I was practicing law in Miami and woke up one day to discover I didn't like my cases, my clients, and even my partners. There were some judges I wasn't too fond of, either. At the time, I was an avid windsurfer. On a vacation to Maui, I got injured so I took out a legal pad and started writing my first novel. Somewhere, I still have the pad, smeared with suntan oil and speckled with sand. I didn't know it at the time, but writing the book was my therapy. Instead of seeing a shrink to talk about my mid-life crisis, I created Jake Lassiter, the linebacker-turned-lawyer, a tough guy with a tender heart. He could do things I couldn't — like get in a fistfight with a witness and gladly go to jail for contempt. He's been thriving as novelist ever since. He even wears shirts now. His newest book. LASSITER, comes out in the fall. But in the meantime, the entire "Lassiter" backlist are now available on the Kindle, the Nook, and your e-reader of choice. A student at Calabasas High School filed a grand theft report after property was stolen from her car. The missing items included a $1,600 Louis Vuitton brown leather purse, a $300 brown leather Louis Vuitton wallet, a $400 silver digital camera, a $250 black ipod, and a $200 Louis Vuitton leather checkbook. She was unsure whether the doors to her car were locked and there was no sign of forced entry into the vehicle. The Shell gas station on Agoura Road was robbed of a 14 sticks of Orbitz gum worth $3.98 and a $.79 pack of cookies. The employee told police that a female entered the store and paid cash for $5 worth of gas and took two packs of gum. She pumped the gas and returned to the story, where the clerk asked her to pay for the gum. The female replied, “I just gave you $30,” grabbed a package of cookies, left the store, and drove away. 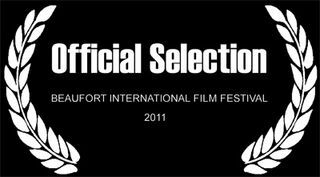 My short film REMAINDERED has been chosen as a finalist at the Beaufort International Film Festival in Beaufort, South Carolina this February and we are honored to be up against some very impressive competition.